THE United Party for National Development (UPND) has been rejected in Mpika as their much publicised rally in the area miserably flopped with traditional leaders refusing to meet the entourage of Hakainde Hichilema and his running mate Geoffrey Bwalya Mwamba. But UPND presidential spokesperson Edward Mumbi said the rally in Mpika was massive and historical and was held at late president Michael Sata’s farm after the police refused to allow the opposition to conduct their public meeting at school grounds. The Daily Nation can report that despite the high publicity and hype and a highly powered delegation of Mr Hichilema, Mr Mwamba, Mulenga Sata, and Miles Sampa, the UPND failed to attract the people of Mpika who were not interested to attend their rally. 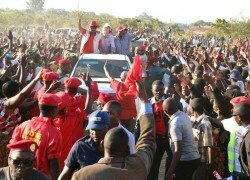 The UPND were greeted with a sparse crowd and a lukewarm reception in late president Michael Sata’s home town and were forced to change their venue for their rally as a consequence. Mr Hichilema, Mr Mwamba, Dr Scott Mulenga Sata and Mr Sampa were also rejected by the chiefs in Mpika whom they had planned to meet and were only able to pay a courtesy call on Chief Mpepo. UPND officials were disappointed that the people of Mpika had rejected their leaders despite being in the company of Mulenga Sata, the son of late president Sata. But Mr Mumbi, the UPND presidential spokesperson, said it was not true that the traditional leadership in Mpika refused to meet Mr Hakainde and his delegation and that the opposition party had the best reception from the people in the area. Mr Mumbi claimed that the Mpika rally was historic and the euphoria that erupted after Mr Hichilema and Mr Mwamba landed in the area was ecstatic and electric. He said it was propaganda for anyone to claim that the UPND had been rejected in Mpika because the crowd that gathered to listen to Mr Hichilema and his entourage was one of the largest in the political history of the area. He said despite a lot of frustrations from State police and Patriotic Front (PF) cadres, the people in Mpika were determined to receive Mr Hichilema and the rally venue had to be moved to late president Sata’s farm. “It is wishful thinking to believe the UPND rally flopped in Mpika and as a matter of fact, it was one of the most successful of the rallies we have held in the recent past. All the traditional leaders wanted to meet us but we refused because of time. ‘‘We had a lot of frustrations and the helicopters carrying Mr Hichilema and Mr Mwamba were refused to land in school grounds. It had to take the Sata family to decide that the rally be held at late president Sata’s farm and it was historic,” Mr Mumbi said. Mr Mumbi said Mr Hichilema and Mr Mwamba together with the entire entourage were humbled with the reception and challenged people claiming the rally was a flop to circulate pictures of the Mpika rally. He said the UPND was not in the business of bussing cadres from their respective areas and that those who attended the rallies were coming on their own because of the love they had for the opposition party and its leadership.